All Saints' is a Grade I listed church situated at the heart of Houghton Regis; in the centre of what used to be the old village. 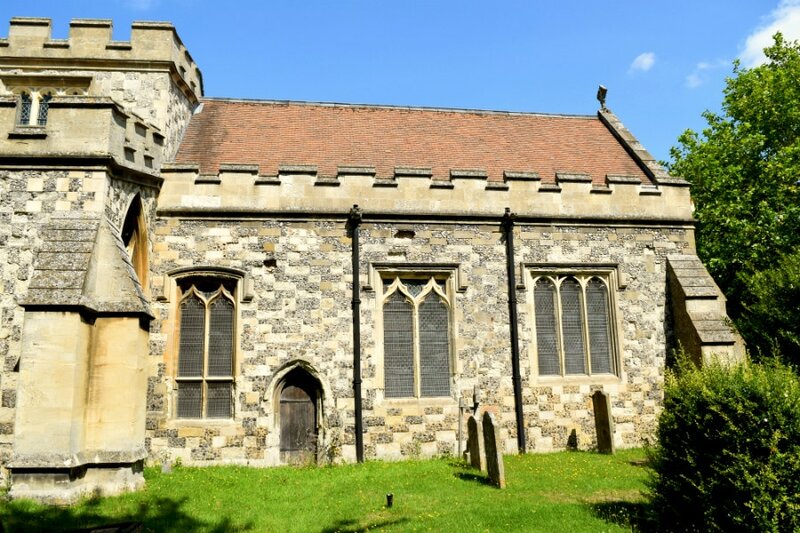 The church is one of the very few in Bedfordshire to be mentioned in Doomsday Book (AD 1086), which records that it was held by William the Chamberlain, who also held Luton Church. Houghton Regis itself was held by the King. Henry I gave Houghton Regis to Robert Earl of Gloucester, his illegitimate son. 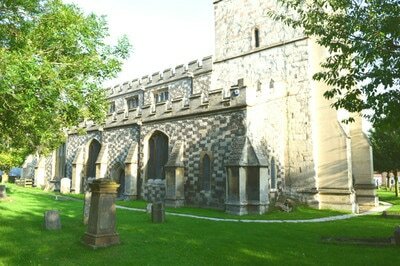 William, son of Earl Robert, granted the church to St Albans Abbey in 1153. The main body of the current All Saints' was built in 14th century in the Rectilinear Gothic style, whilst the tower, the roof and the ceiling of the nave were remodelled in the 15th century. Here are a few things to look out for when you next visit this awe-inspiring place. Extensively remodelled in the 15th century, All Saints' tower is a fine example of Rectilinear style accessed via a staircase in the southwest turret, and crowned by castellation. 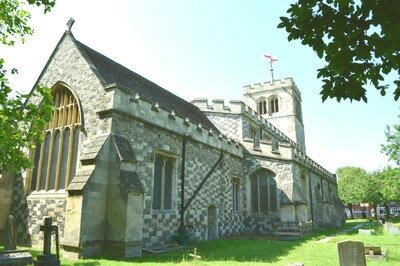 The cross above the tower is a later addition, to which a weathercock was then added in 1750. The tower also houses six bells, a spacious ringing chamber, and a beautiful Victorian stained glass window by Underhill of Exeter above the west door, flanked by medieval canopied niches. The west door, currently blocked up, will be reopened in due course as part of our Restoration and Renewal programme. 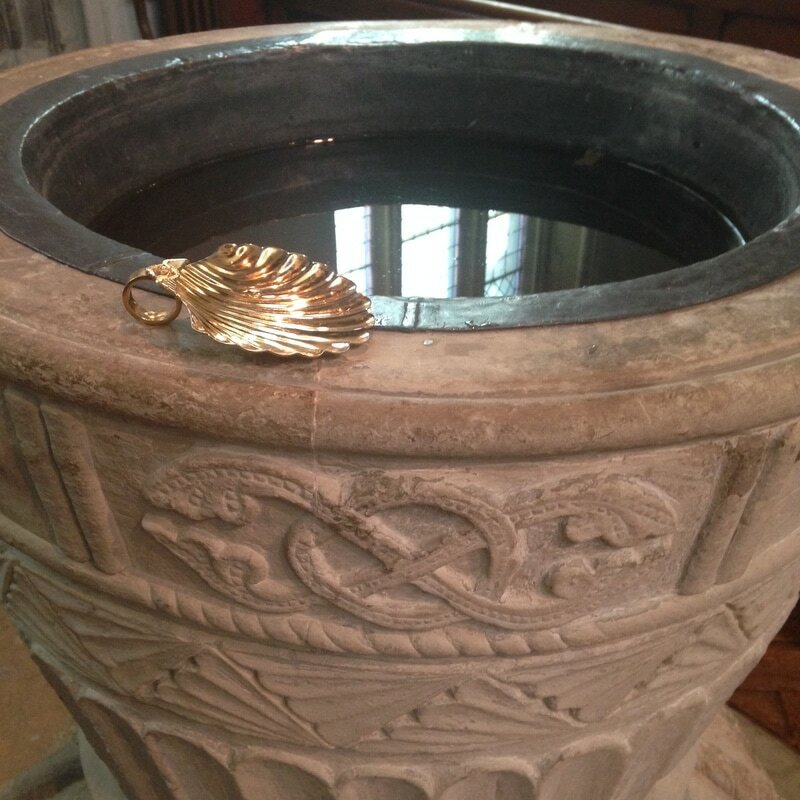 The Norman font is the oldest known part of the church, having been constructed well before the present building was even begun. The font is one of a number of fonts known collectively as the 'Aylesbury Group' after a particularly fine example in the parish church at Aylesbury. It is made of Totternhoe stone, and its elbaorate carvings are particularly good. The led lining was purchased in the 1821, and the lid is made out of reclaimed timber from Houghton Hall. Interestingly, the font is large enough to accommodate baptisms by immersion for young children – an option is still available today! In the south aisle wall is a tomb with the effigy of a knight at with a lion at his feet. This is reputedly the tomb of John de Sewell who accompanied the Black Prince to Aquitaine in 1366 in the retinue of Hugh, Earl of Stafford. It is carved with quatrefoils framing heraldic shields displaying a chevron and three butterflies. This is possibly the earliest heraldic shield associated with a Sewell. The hamlet of Sewell is situated within the parish. A medieval piscina and decorated ceiling indicate that an altar stood nearby. 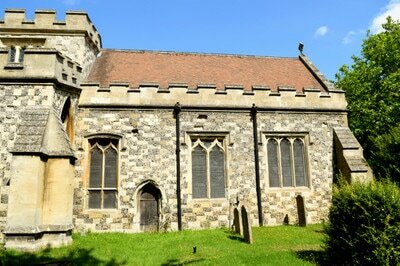 And indeed, this area of the church may have been a chantry chapel for John de Sewell and his family. The chancel (east end of the church) was partly rebuilt in the 19th century after many decades of neglect. At that time the chancel arch was reopened and the roodscreen was restored. The restoration also preserved many other original features, such as the medieval wall safes. The altar rail, made from the reclaimed staircase banister of Houghton Hall, divides the chancel in two areas; choir and sanctuary. The floor is mostly paved with the stone monuments to illustrious members of the Brandreth family, save for the chequered marble flooring around the altar and, most notably, two brasses. One of these is an effigy of William Walley, 15th century vicar of All Saints'. The altar in the chancel and its reredos are made of solid oak carved in the Rectilinear style. These were donated in memory of those who gave their lives during the First World War. The altar is furnished with frontals that are changed according to the liturgical seasons (the photo shows the purple frontal used during Advent and Lent). Frontals are removed only twice a year; for Good Friday, and Remembrance Sunday. The Blessed Sacrament is reserved here and its presence is highlighted by the veil covering the tabernacle, and by the lamp hanging above the entrance of the sanctuary. The east end of the north aisle is occupied by the Lady Chapel; a side chapel dedicate to Mary the Mother of God, under the title of Our Lady of Walsingham. It is customary in many churches to have a chapel dedicated to the Blessed Virgin, but we do not know where the original one here may have stood. 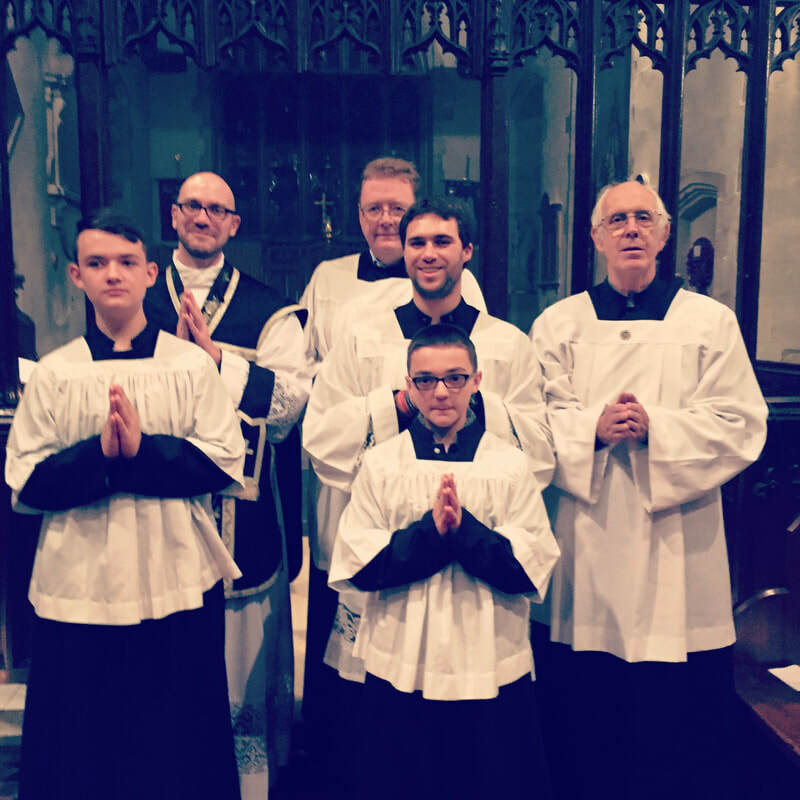 The altar came from Christ Church Dunstable, and so did the frontals. The white one (pictured), though in need of extensive repairs, is a fine example of 19th century ecclesiastical embroidery. The organ is a two manual and pedal instrument, the oldest parts of which were built between approximately 1880 and 1914 by Nicholson & Lord of Walsall. The second manual was installed later by G. Crabbe of Leighton Buzzard. The organ was enlarged by K. Breedon of Bletchley in 1992. The organ is used regularly to accompany the choir and lead the worship on Sundays and during pastoral offices. 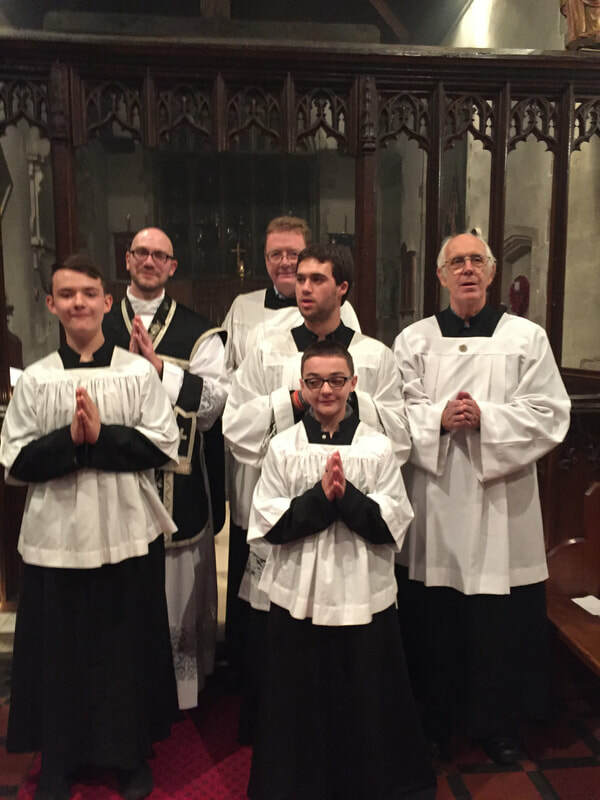 Indeed, the music tradition of All Saints’ is an important part of our mission to the parish and the wider community. Since the 1992 refurbishment the electro-magnetic stop action needs replacing. The cost of this refurbishment is in the order of £28,000. Fundraising has reached nearly £20,000 we still have quite a way to go to reach our target and have the work done.